Why are so many people determined to save Levy’s Beach? 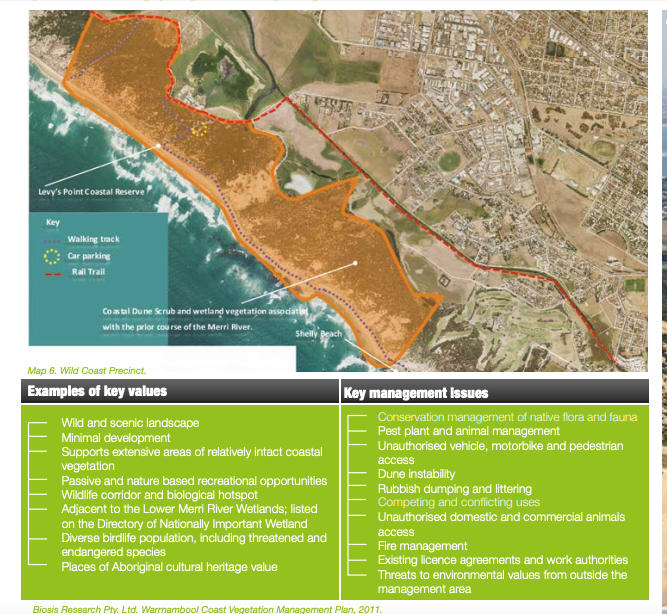 Well, this one page from the W’bool City Council’s 2013 Coastal Management Plan says it all. It is only five years old, this plan, but already the council has trashed it. It took many months and no doubt a lot of money to prepare, but it is worthless because it has failed its first real test. This page, page 20, sets out all that things we cared about and valued at Levy’s, which is part of our wild coast precinct. It also sets out the challenges and what we need to do to repair it and preserve it for the future. Despite this, the council has agreed to allow up to 800 racehorses a week to train on the beach, including a large dune, and to come in and out on a track across the dunes (it is the only way they can get in). Dune instability is one of the issues listed in the plan. Our council has let us down. Our trust in them to protect our wild coast has been betrayed. But when you are betrayed in this way the only thing you can do is fight back, to restore what was supposed to happen in the first place. So on we go.